A healthy lawn keeps your property value up. A happy, healthy lawn reduces soil erosion and filters storm water runoff. A thick lawn also filters and traps sediment and pollutants that otherwise contaminate surface and ground waters. A healthy lawn cools the air and reduces glare and noise. The key to maintaining and achieving a healthy lawn is to fertilize your turf at the right time, with the right amount, and the right product. My learning curve starts by figuring out WHY I need to fertilizer my grass. I always assumed it grew when you watered it daily. WRONG! My next learning goal was to find WHAT product I needed to get. There are lots to choose from and then WHEN do I apply it and how much. Lawns need “food” to stay healthy. Just like our bodies, the turf needs the right nutrients to stay healthy. Some of the nutrients are nitrogen, phosphorous, potassium, calcium, zinc, magnesium, iron, and manganese. Good soil needs to be replenished with nutrients to maintain being healthy. Having your soil tested by the University of Florida to help you figure out what nutrients are lacking in your soil. To get the right fertilizer for your home lawn you need to look for urban turf fertilizer, not fertilizer for flowers or vegetables. Always read labels to get the right product and the right amounts. Urban Turf Fertilizer Labeling Rule (RE-1.003(2) FAC became a rule in June of 2007 when the Florida Department of Agriculture and Consumer Services required labeling information for urban turf (home lawn) fertilizers. Obtaining the right fertilizer will depend on what species of grass you have and the geographical location of your home. For the typical homeowner, a 30 % slow release nitrogen product will provide a longer lasting result and prevent burning from an excessive application. Most box store fertilizers are labeled with nitrogen, a low amount of phosphorus and potassium for your turf. UF/IFAS recommends a 15-0-15 slow release fertilizer. Apply fertilizer during the warm season when days are long and the temperature is high allowing the grass to take up the nutrients. Don’t fertilizer when your grass is not growing; this will create nutrients leaching through the soil and run off. You want to avoid leaching. Be aware of the ordinances is your area that limit the time you can fertilizer. In Marion County, April 15th is ideal and then again around the end of September. The ratio is 1 pound of nitrogen for every 1000 square feet of lawn for each application. Applying the wrong amounts increases disease and insect problems. Many fungal issues are related to high nitrogen applications. These three nutrients will help keep your turf grass healthy. Nitrogen, being the most important component of a turf fertilizer is responsible for the green color and the grass blade growth. If you purchase a fertilizer that is not slow release you may see your turf become green and grow fast the first 3-4 weeks but then stop. You can keep your turf looking good for a longer period of time using a slow release fertilizer. Phosphorous is responsible for the root system of your turf. 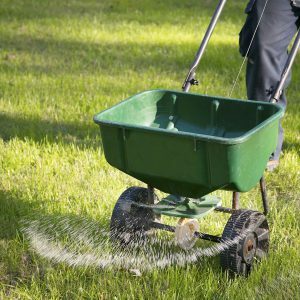 Starter lawn fertilizers will have a high phosphorous count to get the lawn established; once it has an established rooting system typically you would look for a fertilizer with a low amount of phosphorous. Potassium helps keep your turf healthy from disease, drought and cold. I found a tip while researching for this article, “Up, Down and All-Around” to help you remember the number system. Up is for rapid growth (first number); down is development of the roots (second number) and all around is the health of your overall grass (third number).